Today we are introducing to you the renewed Linkify report page! 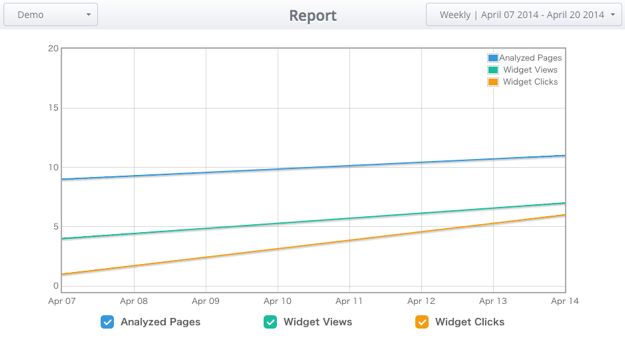 Our previous report page only showed the graph for Analyzed Pages; the latest renewal has added graphs for Widget Views and Widget Clicks! The grpahs can be toggled on and off intuitively by checkbox, so it shouldn’t bother you when analyzing multiple articles. We have also added the option to display Weekly graphs in addtion to the Monthly, Daily, and Hourly options that we already had. We are really proud to introduce to you the Keyword Report. As you see, Keywords displays Linkified keywords in a list. The list can be sorted incrementally or decrementally. Widget Views will sort keywords by the number of times each keyword had its pop up widget displayed. Widget Clicks will sort keywords by the number of times each keyword was clicked within its widget. We are always eager to receive your feedback! At Linkify, we are always eager to receive your feedback on our services or requests for new functions. This entry was posted in News on May 7, 2014 by ayaeh. ← Linkify is now an iCab module!